President Donald Trump, left, shakes hands with Japanese Prime Minister Shinzo Abe during a joint news conference at the Akasaka Palace, Monday, Nov. 6, 2017, in Tokyo. 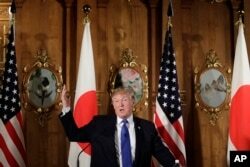 Japan’s prime minister, standing alongside the U.S. president, borrowed a Donald Trump phrase on Monday, agreeing that “all options are on the table” when it comes to responding to North Korea’s weapons development. Abe, at a news conference with Trump at the Akasaka Palace in Tokyo, said there is “no point in dialogue for the sake of dialogue with North Korea” and the time has come to exert maximum pressure on Pyongyang. Abe and Trump, following a second day of meetings, confirmed that North Korea has been the dominant topic of their discussions. Trump repeated that the era of strategic patience, in attempting to deal with Pyongyang, is over. President Donald Trump speaks, accompanied by Japanese Prime Minister Shinzo Abe during a joint news conference at the Akasaka Palace, Monday, Nov. 6, 2017, in Tokyo. “Some say my rhetoric is strong, but look what’s happened with weak rhetoric over the last 25 years,” the president said criticizing the approaches of previous U.S. administrations. But he declined to answer a Japanese reporter’s question about whether he is prepared to go to war with North Korea. The president was also asked about what fresh message he has for Kim Jong Un; the Reuters news agency reporter noting Trump’s response to a VOA question on Air Force One on the way to Japan in which he referred to the North Korean people as industrious and warm. Trump also said North Korean leader Kim Jong Un, who he has belittled as “Little Rocket Man” should send back to Japan any surviving Japanese abducted by North Korean agents over decades. 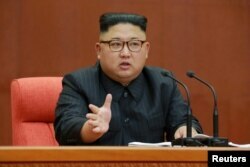 Kim Jong Un speaks during the Second Plenum of the 7th Central Committee of the Workers' Party of Korea (WPK) at the Kumsusan Palace of the Sun, in this undated photo released by North Korea's Korean Central News Agency (KCNA) in Pyongyang, Oct. 8, 2017. Abe revealed during the joint news conference that on Tuesday he will announce his country will freeze assets of nearly three dozen North Korean groups and individuals. The unilateral measures follow enhanced sanctions on North Korea placed by the U.S. Treasury Department and the United Nations. Trump arrives in South Korea on Tuesday and is to address the National Assembly where he is expected to reaffirm the U.S. commitment to defend America’s ally against Pyongyang. A nearly three-year war on the Korean peninsula in the early 1950s ended in a stalemate that pitted the United States, South Korea and the United Nations against North Korea, which was backed by forces from China and the Soviet Union. No peace treaty was signed and the Korean peninsula has remained divided ever since. North Korea makes frequent claims that the United States is seeking to reignite full-scale conflict. State media in Pyongyang on Monday, referring to Trump, said that “no one can predict when the lunatic old man of the White House, lost to senses, will start a nuclear war” against North Korea.